The Appalachian Oak line is a traditional oak cabinet that can be applied in many settings. Constructed from solid wood making it durable in light commercial, residential or rental property application. 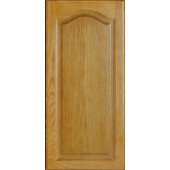 The Appalachian Oak cabinet is a standard overlay door style with a raised panel door. The interior finish is stained to match the exterior with 6 way concealed adjustable hinges. This is a great value cabinet!